Burtown House in County Kildare is an early Georgian villa, surrounded by lush flowers, vegetable and woodland gardens. Beautiful parklands and farmland walks make it a destination worth visiting, close to the town of Athy. 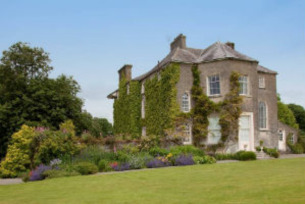 Burtown House is a historic Quaker house located in County Kildare and surrounded by a wealth of farmland walks and beautiful flower gardens. Close to a variety of important historic attractions, it’s the perfect stop on a holiday itinerary around Kildare and the rest of Leinster. Built in 1710 by the Quaker Robert Power, today Burtown House has parking facilities, toilets, a shop, gallery and a modern coffee shop that serves tea, coffee, homemade biscuits, cakes and food prepared with organic, seasonal produce from the on-site kitchen garden. Surrounded by flower gardens, vegetable patches, parklands and woodland walks, Burtown House also boasts a series of secret gardens, ideal for a wander with the whole family. The gardens come to life in early February with a spectacular show of winter aconites, snowdrops, cyclamen and early spring bulbs, followed by many varieties of daffodils, hellebores and trilliums. The closest village is Ballitore, home to one of Ireland’s most historic pubs, E. Butterfield’s (also known as The Harp). Athy is the closest town, offering many historical attractions and a good selection of pubs and shops—notably Clancy's Pub, which hosts a long-running Irish trad night every Thursday. Moone High Cross is two miles from Burtown House and what remains of the historical Belan House and Estate is a short distance. Ballintubbert Gardens, Altamont Gardens, the Curragh Racecourse, Punchestown Racecourse and Athy Heritage Centre are all within easy reach, making Burtown House an excellent destination to plan your holiday in Kildare around.